Isaac Newton Phelps Stokes (1867-1944) was a housing reformer, real estate developer and architect from a prominent and wealthy New York family who trained at Columbia and at the Ecole des Beaux-Arts in Paris after receiving his bachelor’s degree from Harvard. 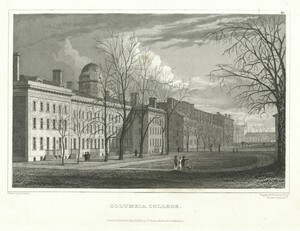 In partnership with John Mead Howells, it was Stokes who designed St. Paul’s Chapel on the new Columbia campus at Morningside Heights between 1903 and 1907. Earlier, he had served on the New York State Tenement House Commission, which wrote the ground-breaking New York Tenement House Law of 1901. One of Stokes’ longest-lasting legacies, however, came as a consequence of his enthusiasm for collecting prints, which he began to do in 1899. 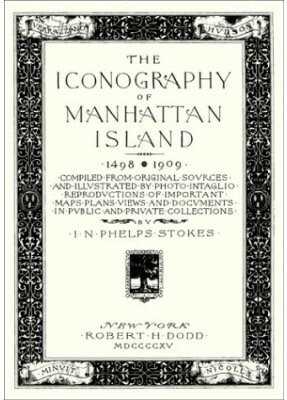 His collecting activity intensified along with his interest in the history of New York, which together resulted in his monumental work, The Iconography of Manhattan Island, 1498-1909, a six-volume pictorial history published between 1915 and 1928. In 1922 Stokes expanded his collecting interest to include views of other major cities. In 1930 he donated the entire collection, which by then included prints, maps, drawings, paintings, view-books, photographs and other documents, to the New York Public Library, where a selection of images can now be viewed online as the I.N. Phelps Stokes Collection of American Historical Prints, part of the NYPL Digital Gallery collection Picturing America, 1497-1899: Prints, Maps, and Drawings bearing on the New World Discoveries and on the Development of the Territory that is now the United States. The I.N. Phelps Stokes Papers consist primarily of correspondence regarding his print collection and the research for and publication of the Iconography. They are housed in the Library’s Manuscripts & Archives department in the Humanities Division at 42nd Street and Fifth Avenue. 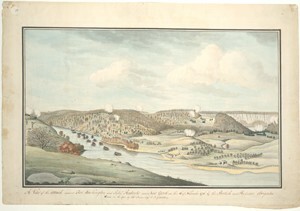 The digitized Stokes images are grouped into eleven separate collections, with three of them containing views of old New York: The Bourne views of New York, 1831 (18 items); Views in New-York and its environs, 1831-1834 (17 items); and Individual prints, drawings, paintings and maps in the Stokes Collection [1585-1891] (670 items). They are the source for many of the plates Stokes used to illustrate the Iconography. With such an opening sentence in the preface to the first volume, it is not surprising that the finished work expanded to six volumes, and took thirteen years to complete; Volume I alone took six years to research and bring to publication. It covers in four chapters the Period of Discovery (1524-1609), the Dutch Period (1609-1664), the English Period (1664-1763), the Revolutionary Period (1763-1783), and what Stokes chose to call the Period of Adjustment and Reconstruction: New York as the State and Federal Capital (1783-1811). The plates in this volume date from 1650 to 1811. 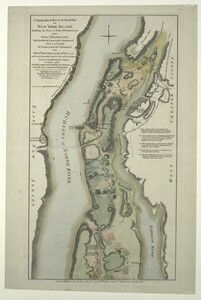 Volume II covers the earliest cartography of the New World and the geographical location of what would eventually become New York, with maps dating from 1500 to a contemporary Bromley map of 1908. Volume III resumes the historical narrative in another four chapters: The War of 1812 and the Period of Invention, Prosperity, and Progress (1812-1841), the Period of Industrial and Educational Development (1842-1860), The Civil War and the subsequent Period of Political and Social Development (1861-1876), and the Modern City and Island (1876-1909). It also includes a Landmark Map superimposing the street plan as it existed in 1909 with the original shoreline of the island. Volume VI, published in 1928, in addition to an apology to the subscribers for having taken so long to complete, includes a section devoted to the mapping of the original grants and farms, a continuation – from Wall Street to Harlem – of the Dutch grant material presented in Volume II. 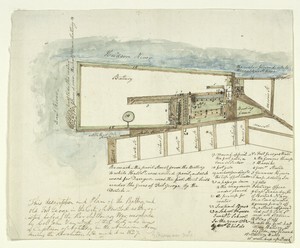 There are additional maps, drawings and views of all periods acquired since the publication of the earlier volumes, also an addendum to the Chronology, a Bibliography, and the Index. Along with personal and place names, the Index offers “group headings” for such subjects as Artists (Painters, Sculptors, etc. ); Associations, Clubs, and Societies; Cemeteries and other Burial Places; Forts and Fortifications; Libraries, Art Galleries, Museums, etc. ; Newspapers and Magazines; Prisons and other Places of Confinement or Punishment; Taverns, Coffee Houses, Hotels, Boarding Houses, etc. ; and many others. As of January 2009 v.1-4 available digital form at Stokes, I.N. Phelps. 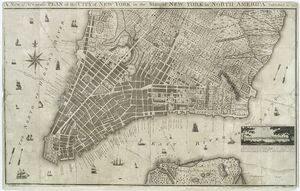 The Iconography of Manhattan Island, 1498-1909. New York: Robert H. Dodd, 1915-1928. For more information on I.N. 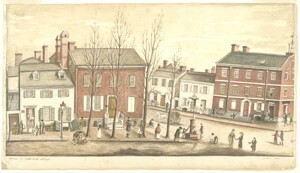 Phelps Stokes, see Christopher Gray’s ‘Streetscapes’ column in the Sunday New York Times real estate section, Jan.29, 2006, and the collection guide to the I.N. Phelps Stokes Papers, 1909-1944 (MssCol 2892) in the New York Public Library’s CATNYP online catalog.